Artful Steel's products represent the perfect union of form and function. They are created by handpan musicians; for handpan musicians. Artful Steel was born out of equal parts passion and frustration. A chemical equation from which beautiful products are formed. For the past year, the team at Artful Steel have been dedicated to creating the ultimate handpan wall mount. As handpan enthusiasts, we have gained an insight into the handpan community and designed every aspect of our product around the needs of the player/musicians; from the need for storage to the safety of your instrument, to the minimal foot print and ease of use. We passionately believe that your instrument is a work of art to be played and displayed. Show Your Art. Play Your Art. — Colin Foulke, Handpan Maker. Sign up with your email address to be the first to know about news and promotions. Thanks for signing up. We promise not to spam you! Will this wall mount keep my handpan secured to the wall? Artful Steel wall mounts are designed to safely withstand a load of up to 20lbs. We worked closely with our manufacturers to design the highest durable quality wall mount that would secure a handpan flush against the wall and keep it safe and secure. Will my handpan get scratched using the wall mount? 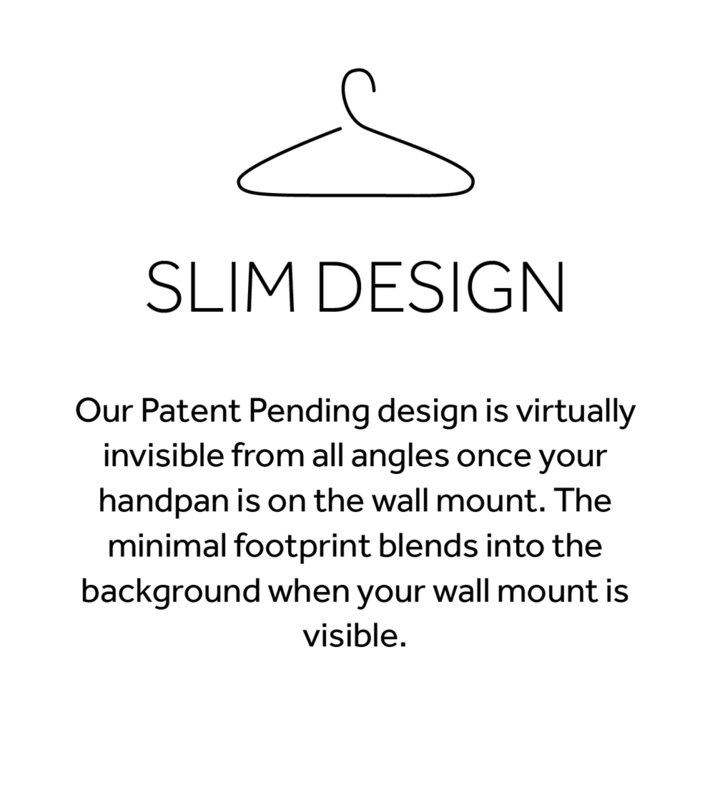 You can confidently display your handpan on your Artful Steel Wall Mount knowing that the steel arm we designed, is covered in a protective coating to ensure there is no metal to metal contact. We specifically created our landing pad as a means to protect your instrument from the wall. Is the wall mount easy to use? Artful Steel wall mounts are incredibly easy to set up. Your wall mount is made of two parts with all of the holes predrilled and to make setup even easier we have included the mounting hardware. How do I assemble and install my wall mount? You can install your wall mount by following our video instructions. Here is an instructional video to help you with your installation. What are the benefits of using the Artful Steel Wall Mount, can’t I just keep my handpan on the floor or in it’s travel bag? The are many benefits of using Artful Steel Wall Mounts! For starters as the name implies, you are literally displaying your handcrafted handpan instrument as the beautiful work of art that it is! This product was born out of necessity. Getting your handpan off the floor and onto the wall to be displayed as art, ensures that your handpan will not be accidentally kicked or knocked over, keeping your instrument safely secured on the wall. Keeping your handpan stored in it’s travel bag (if you have one) is not ideal daily storage as moisture can get trapped in the bag, causing your pan to rust over time. Lastly, your pan is meant to be played, to make your handpan easily accessible on a daily basis, you simply dismount the pan from your Artful Steel Wall Mount and simply mount it back upon your Artful Steel Wall Mount when you are finished playing, it’s that simple! Will my wall mount fit my pan? Our patent pending design was created to fit a wide range of handpans, by utilizing the necessary center Gu or open port. To date, it has been tested with PANArt Hang, Pantheon Steel Halo, Spb Pantams, BEllArt BELLs, Symphonic Steel, and EchoSoundSculpture AsaChan. What type of wall can I hang my wall mount on? The hardware that is included with your wall mount is intended to be used with drywall. If you plan on hanging your wall mount on another type of wall, please use the appropriate mounting hardware for your wall type.